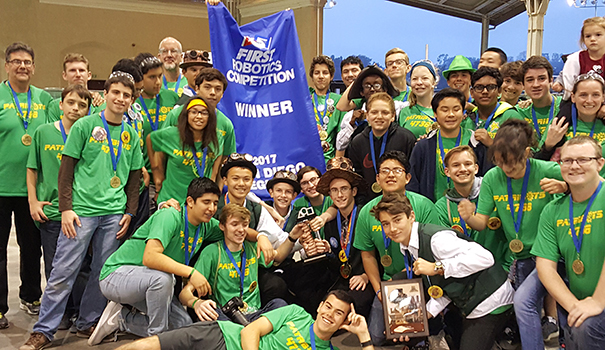 order now The Patrick Henry High School (PHHS) robotics team, the Patribots, took home its first regional championship after a three-day long competition at The Del Mar Fairgrounds held March 9–11. This is the fifth year the team competed at the regionals, but its first year making it into finals. https://sheisfiercehq.com/shop/ This year’s game, titled STEAMWORKS, challenged robotics teams to work together in alliances to gather gears, collect fuel, and climb four feet high. The Patribots’ robot stands 3 inches tall and can lift its 120 pounds 4 feet high by deploying an onboard winch. After two days of qualifying matches, the Patribots were ranked 14th with a 5-3 record. Senior Anthony Jaynes led efforts in the Patribot pit to repair the robot while programming lead Sean McDonald worked to troubleshoot problems and improve the code, overcoming a broken chain and a disabling collision that led to losses in two of their qualifying matches. The ranking was good enough to the to get them into the elimination finals as the second team selected during the alliance selections. In the finals, and in alliance with 3rd-ranked Team Paradox from Encinitas and 15th-ranked Daedalus from Escondido, the Blue Alliance ran together a string of exciting victories. The Patribot’s small, quick robot proved itself in the finals by living up to its name, The Gear Gopher. Yet, it was its last second climb in the best-two-of-three finals that sparked a roar that rocked the arena. With less than a second left in the match, the Patribots touch pad light turned blue — final score: Blue 307, Red 305. The Patribots were champions. Drive team coach Harrison Lange, drivers Cooper Smith and Caden Rivera, human player Johnny Hays, and pilot Camaron Jaynes celebrated with their allies on the field. Team members in the stands, led by four-year member, president Tyler Bercu, burst into celebration. As the jubilation subsided, the team took a moment to recall their road to this championship. The previous year’s failures taught valuable lessons. In 2015, the team placed 49th. In 2016, mechanical failures mounted as the tournament pressed on and the team left the San Diego Regional ranked at the bottom. This year, a team dedicated to learning from its mistakes emerged. Led by design lead Walker Madsen and build lead Jacob Lerner, the team did the math as they designed, prototyped, and modified the robot’s design. The team’s 32 student members and nine adult mentors worked to make this a successful season. The Patribots are organized into subsystem groups that work to complete the demanding tasks of the 2017 challenge. Team members work Monday through Friday into the evening and all day Saturday while balancing demanding courses like AP Physics and Calculus as they dedicate hours to design, build, and program the robot. Members of the Patribots also work with local schools, Dailard Elementary and Pershing Middle School, to share robotics experiences that inspire interest in the application of math and science. This summer, team members will be providing robotics camps in the San Carlos area to inspire future Patribots to engage in STEM (science, technology, engineering, math). Next up, the Patribots will represent PHHS at the FIRST Robotics Competition (FRC) Championships held April 19-22 in Houston, Texas. A field of 400 elite teams from over 40 nations will compete to take home the title of FRC champion. In order to get to the competition, the team will need to raise $25,000 and are currently looking for additional corporate sponsors and donations. Patribots current sponsors include Qualcomm, Northrop Grumman, The National Defense Education Program, All Star Glass, Arrow Machine Industries, The PHHS Engineering Program, PHHS Foundation, and Natural Networks, Inc.
—Harold Mumford is Patribots coach, Adria Van Loan-Polselli is a Patrick Henry engineering teacher, and Carolina Alduenda is a proud parent of a Patribots team member.